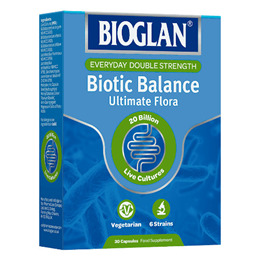 Bioglan Biotic Balance has a well balanced formulation with high quality live bacteria containing 20 billion live bacteria in each capsule. You get all the live bacteria equivalent to 5 tubs of yoghurt without the calories, fat or sugar. Bioglan Biotic Balance Capsules contains 4 strains of live bacteria, which is double the number of species than most of the market leaders. 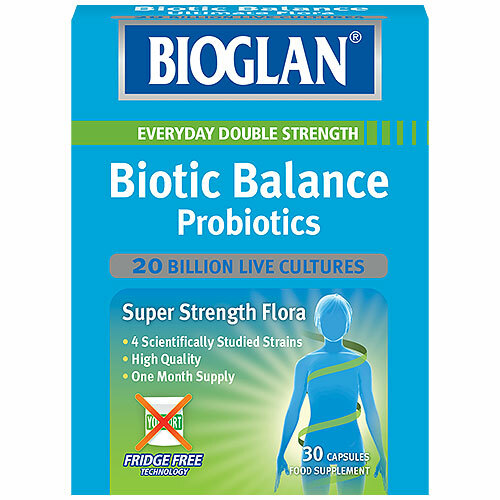 There is no need to keep bioglan biotic balance capsules in the fridge, meaning you can keep it in the cupboard or your bag for convenience. The level of live bacteria is guaranteed for the life of the product. Live Cultures: (Lactobacillus Acidophilus, Lactobacillus Rhamnosus, Bifidobacterium Longum, Saccharomyces Boulardii - cultured from Lactose/Milk protein), Capsule Shell: (Hydroxy Propyl Methyl Cellulose), Anti-caking Agent (Magnesium Stearate). Consult your healthcare professional before taking if you are under medical supervision, on medication or pregnant. Food supplements should not replace a balance diet or healthy lifestyle. Store below 25C in a dry place. Keep out of sight and reach of children. Below are reviews of Bioglan Biotic Balance - 20 Billion - 30 Capsules by bodykind customers. If you have tried this product we'd love to hear what you think so please leave a review.